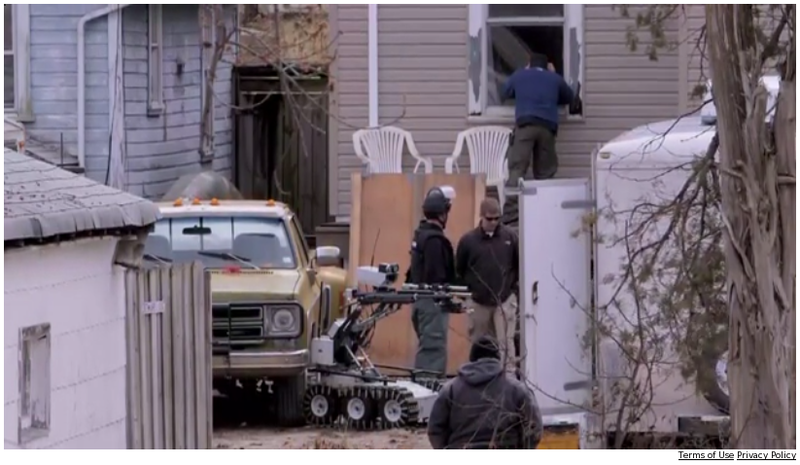 In covering a story on the arrest of a political dissident (local mirror) in St Louis, the St Louis Post Dispatch managed to catch footage of local law enforcement officers working in tandem with a robot armed with a shotgun. This armed drone operating in an populated urban area by what is at least nominally a civilian law enforcement agency raises a number of disturbing questions about the future progression of the American Rogue State. While the use of robots for locating and disabling bombs is not a new trend, the use of armed drones for this task is not something which has been documented frequently in the United States. There are serious reasons to be concerned that in the name of officer safety drones fitted with small arms might make their way into other hazardous situations faced by officers, but for which human judgement and discretion ought to be regarded as necessary. How many years will it be before armed drones are applied to such tasks as breaching into residences or engaging in crowd control? Concerns about these sorts of changes in the United States law enforcement environment ought to concern anyone located in the United States who is involved in any activity like Bitcoin or free speech activism that the law and law enforcement might take a turn towards treating in an unkind manner. Effective physical and personal security mitigations against this threat in the United States are not likely possible to be effectively planned, especially for whatever person has the honor of being first to encounter such an application of armed drones. This entry was posted in News, North America, The Law. Bookmark the permalink. Sentenced to 366 days on a single federal gun charge. The urban survivalist that is. Terror bot disposition unknown.